No Second Chances is the final companion novel in the Dodge Cove Trilogy. I read No Love Allowed (review here) and No Holding Back (review here) last year, and I was excited to read Natasha’s story next. Natasha and Jackson were inseparable until Jackson left one day without a word to anyone. Jackson thought he could leave Dodge Cove without looking back in order to pursue his dream of becoming a successful DJ. Even though he has achieved his goal and had become a world-famous DJ, he realizes how much he needs Natasha and heads back to Dodge Cove in order to get her back. Natasha was devastated after Jackson left her. A year later, Natasha’s finally starting to get back to her normal self when Jackson pops back into her life. Still angry and not ready to forgive him, Natasha makes the grand statement that Jackson would need to “stop time, defy gravity, and bring down the stars” before she could forgive him. But what she doesn’t know is Jackson is willing to do just that—the impossible—in order earn her forgiveness and win her back. Jackson’s grand gestures were fun and creative. I wasn’t expecting these grand gestures when I first started reading the book, so I enjoyed seeing how they all played out. Even though these were a fun additions, I think Natasha and Jackson still needed a more serious conversation about their relationship. I hate to say it, but some parts seemed to be just a little too childish. I also enjoyed the cameos of the previous characters from the Dodge Cove Trilogy and glad they were incorporated. 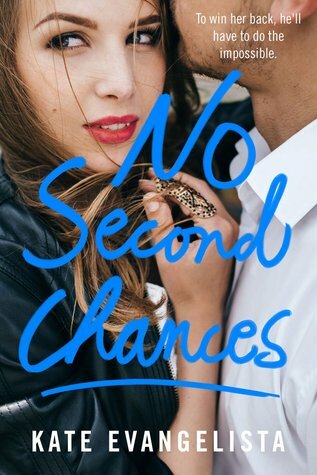 Overall, I didn’t enjoy No Second Chances as much as the other two books in the Dodge Cove Trilogy, but it was still a fun read. This sounds like a fun, cute read – perfect for the beach this summer! 🙂 Glad you liked it! Thanks for including me on the tour! This doesn’t really sound like a book I’d enjoy – I’m not a huge fan of immature characters (except in certain circumstances in YA). But I’m so glad you liked it, even if you enjoyed the first two books more. Great review!